Power lines seen down on the street in Huntington Beach, Calif., where hundreds were without power on Sunday, March 13, 2016. HUNTINGTON BEACH, Calif. (KABC) -- Hundreds of people in Huntington Beach were without power after a massive outage late Saturday night. SoCal Edison officials said about 730 customers were without power, and service was expected to be restored sometime Sunday morning. 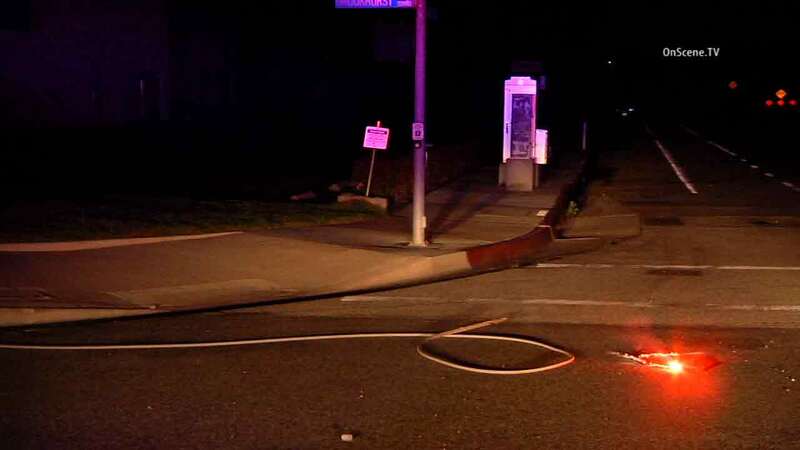 Officers on a call said they heard an explosion in power lines near Brookhurst Street and Hamilton Avenue at about 10:52 p.m., according to Huntington Beach police. Soon after, several additional power lines fell down in the area, causing nearby intersections to be blacked out. Authorities said the affected area appears to be residential. The cause of the outage was due to a broken cross arm, according to SoCal Edison officials.